Here’s a great idea for an in-store or online promotion: combine cause marketing with BOGO, the popular “buy one, get one free” concept, to offer Buy One, Give One. A few big companies have been doing this for years, specifically the shoe company TOMS. Their promise to give a shoeless child in Africa a pair of shoes for each one sold has been expanded to include donations of sight, water, safe birth and bullying prevention services to people in need. Other companies selling everything from soccer balls to medical scrubs are offering the new BOGO. This Real Clear Life article mentions 16 brands that are doing One-for-One Giving, although some are making a cash donation rather than following the give-one model. It’s heartwarming to know that quite a few wholesale vendors in our industry promise to donate goods or cash to a specific non-profit for each item sold. Chavez for Charity is in fact an entire line based on this concept, with 25% of the profits going to the different humanitarian charities represented by the ten colors of bracelets in their collection. How can you make the new BOGO work in your store? The first step is to select a cause that will resonate with your customers. You might even conduct a Facebook poll to have them participate in selecting which of three or four non-profits you will be donating to. Next select a product that you carry that the charity can use – for example food or teddy bears for a homeless shelter, or dog toys for the Humane Society. If you don’t carry a product that is appropriate, come up with a specific description of what you will buy. 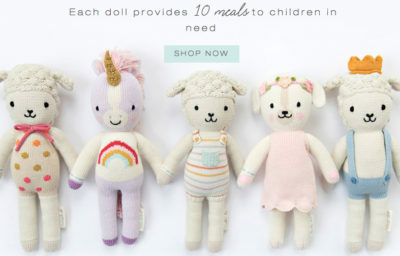 Cuddle + Kind, for example, advertises that they donate 10 meals to children in need for each hand-knit doll sold. You may want to set a specific time for your Buy One, Give One offer in order to create a sense of urgency – the holidays are perfect for this type of feel-good marketing. In addition to promotion through your email blasts, and social media, ask the non-profit to reach out to their supporters. Helping non-profits in your community demonstrates the importance of shopping local, and hopefully will bring new customers into your store. PS Here’s a chance to help other small business owners in your community! 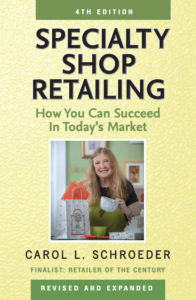 In the spirit of the new BOGO, I will donate one copy of the 4th edition of Specialty Shop Retailing: How You Can Succeed in Today’s Market to the public library of your choice for each one purchased directly from Specialty Shop Retailing by December 20. Just send me an email with the name and address of the library after you’ve placed your order.